The future looks bright for "cult classic" Alan Wake, which has now sold more than two million copies on the Xbox 360 and PC. Alan Wake wasn't exactly a runaway hit when it came out on the Xbox 360 back in mid-2010, earning good reviews but not exactly selling a truckload. But Remedy, the studio responsible for the game, persisted with two DLC releases, the stand-alone Xbox Live Arcade release Alan Wake's American Nightmare and of course the long-awaited PC version of the game, and now two years down the road it turns out that the game has sold a couple million copies. That's not a huge hit in today's industry but the studio is pretty happy about it, and it goes a long way toward ensuring that we haven't heard the last of Mr. Wake. "We've moved over two million copies - that's including PC," Hakkinen told CVG. "So after a slow start it's turning into something really positive. It's definitely had legs. I think narrative experiences just have a tendency for that." "Alan Wake is definitely very close to our hearts. It's our IP - we own it. It's not something that we're going to forget very easily," he continued, explaining that the franchise will likely continue. "After Max Payne we could've literally gone, the whole team, and sat on a beach and sipped cocktails for quite some time. It's no secret that the Max Payne franchise was sold for $45 million. That put us in a really promising situation, but at the same time our hearts are in making video games and not in sipping cocktails on the beach." Hakkinen didn't break down the sales by platform but said that the 360 releases make up the "lion's share" of sales, while the PC release is what pushed it over the two million mark. The XBLA release Alan Wake's American Nightmare is also doing very well, he added. "The franchise as a whole is doing well and its great to see new fans finding Alan Wake and experiencing our story," he said. "Personally, I think in general games get 'old' way too quickly, but there seems to be something ageless about how a good story engages people, and judging by the fan responses we have gotten, Alan Wake seems to be doing just that. It actually feels quite similar to how people find great movies they missed when they first came out." 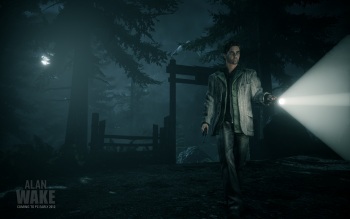 The retail edition of Alan Wake for the PC is set to hit North American shelves on April 3.